It's Tuesday and you know what that means. New releases and a chance to win a free image from Sassy Cheryl's. Last week, I had many emails asking for more than one image to choose from. So this week there are two. Thanks to everyone who entered my first Color Me challenge. All of your entries were amazing and I certainly appreciate you taking the time to color and create these cards! I KNOW that it takes some serious time! So, let me announce the winner of the 1st Color Me challenge and see what's new for this week at Sassy Cheryl's. 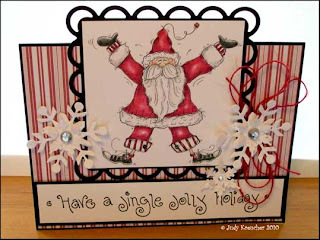 The winner of the 1st Sassy Cheryl's Designs, Color Me challenge is . . . . . . Isn't this just the cutest thing. Zach had a really hard time choosing and actually got a little angry with me for giving him the task. He didn't realize how hard making a single choice would be! I guess it was just too much pressure, so I may have to have hubby do it from now on. We'll see! Now, for the new releases. 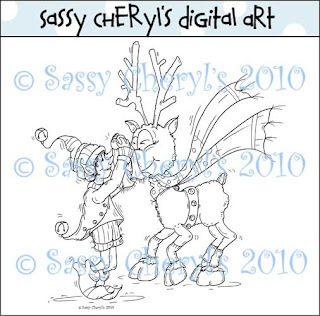 Here are just two of the seven new images available today at Sassy Cheryl's. I hope that you will enjoy them. Remember, these 2 images are NOT for the COLOR ME CHALLENGE. Those are listed down further. Available as both a digi (available for $3) as well as a colored image (available for $4). Now. . .on to the Color Me Challenge. Since there are two images available this week (Cappucciono Anyone Snowman & Shining Rudolph's Nose), you may color one, or you may choose to color both. The choice is up to you. And just as last week, they will both be made available for just $2 while the challenge is going on. There will be a winner chosen for each image. 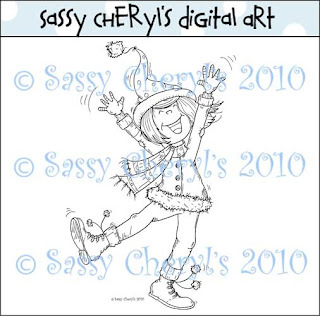 The winning images will be the model for my colored image listed in the Sassy Cheryl's store, as well as having their cards featured under their coordinating digi stamp as an example and an inspiration for others! Here are the two images that you have to choose from. Remember, you can color and enter a card for each image if you'd like. You may also enter it on the Sassy Cheryl's Challenge Blog too...IF you follow the challenge requirements, which this week happens to be Countdown to Christmas. And remember, when coloring, the skies the limit. Add your own personal touches. . . .Go out on a limb! So, which one will you choose, Cappucciono Anyone Snowman or Shining Rudolph's Nose? Or will you choose to color both? Surprise me! Once your card is completed, simply post your photo(s) to your blog or online gallery at PCP, SNR, SCS, Flickr, Photobucket, etc. and then link that post or photo back here using Mr. Linky. It's as simple as that. So come on, let's get coloring! The winners will be chosen by my 16 year old son Zach & will be announced the following Tuesday with the new Color Me post. And remember, if you follow the challenge rules on the Sassy Cheryl's challenge blog of countdown to Christmas, you can enter your image in that challenge too. Double your chances of winning. 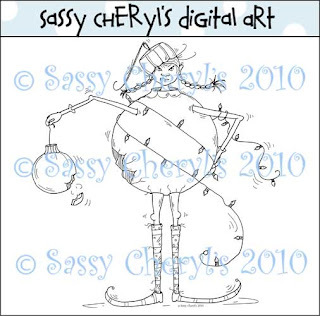 Each winner will receive a FREE IMAGE from the Sassy Cheryl's shop. And don't forget to join in the Show Me post on Thursday. It's TONS of fun snooping around! BIG congrats Judy and sooooo well deserved! As soon as I saw those stripes I thought to myself "winner"
I just found those stamps yesterday and I bought some.Hope I´ll have time today to use them!!! Congrats Judy! And thank you to everyone for entering. Poor Zach, I think he's still traumatized from having to choose just one. Ok. . .everybody. . .grab your favorite and join in this weeks Color Me challenge! Judy you must be thrilled, congratulations. I love, love the new images Cheryl. I need more time to color because I cannot decide! Congratulations Judy!!! Well deserved honor. Can you guess that I will have to have Cheryl in her winter outfit. Wonder what I can make her pop out of now. The wheels are turning, slow though since I haven't had my coffee yet. Congrats Judy! Your card was amazing, Zach picked well. I may have to take a trip to Hobby Lobby this weekend to check for your ceramics. (about an hour away - UGH!) Anyone feel like a drive? Judy, WOOHOOO for you. Zach did a great job picking a winner. Cheryl, are you trying to break me with so many awesome images in one week? Off to go shopping just here in a minute. 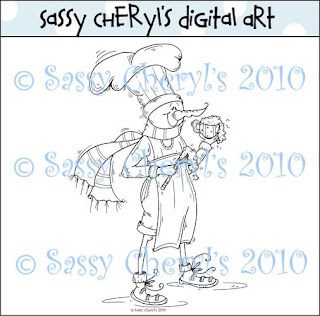 Think Sassy Cheryl in Winter is going to be the perfect for a Birthday card I'm doing. I'm headed to HL tomorrow, more to check out your stuff than to buy any crafting stuff. Here is my Messy Desk, I mean, what are you working on? Not a very revealing pix this week. Cheryl, well I entered one card so far,before I do the next one I think I will have a cappuccino to get me in the spirit.